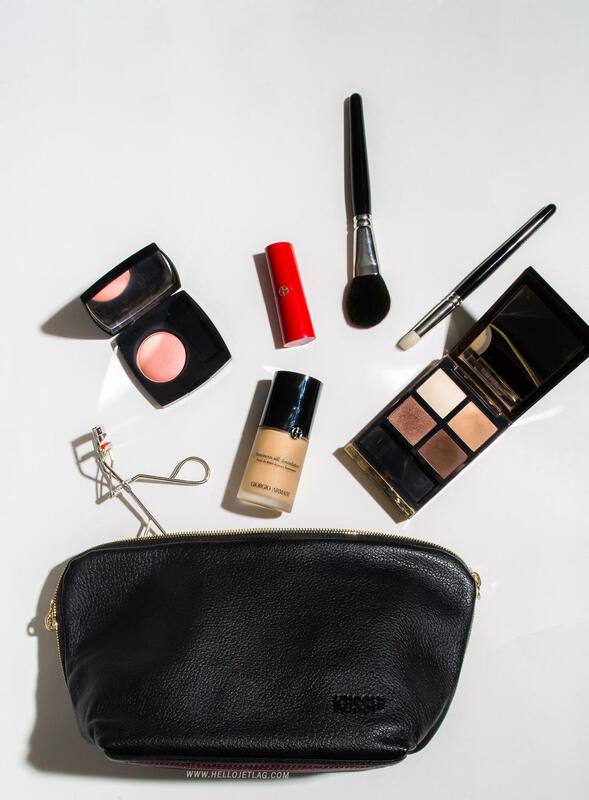 As a makeup artist by trade and a traveler at heart, I constantly find myself fine tuning, re-organizing and simplifying my on the go makeup and skincare set up. In fact, inside of my closet I have a bag.. and it’s jam packed with other bags. Clear, mesh, printed, hard sided… you name it and chances are I have several versions. When Kusshi contacted me about testing their makeup bags, I was on the fence because I’m pretty well covered in that department. However, once I started to do a little bit of research into the company’s products, I realized how much thought Kusshi has put into the design of their bags. 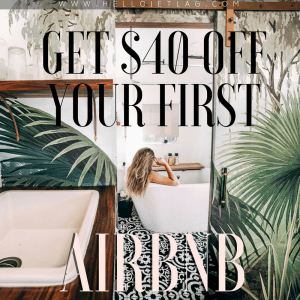 They offer details I’ve never seen in a travel makeup bag, such as Beauty Blender pockets, washing machine friendly materials and accessories that cater those of us who are always on the go. 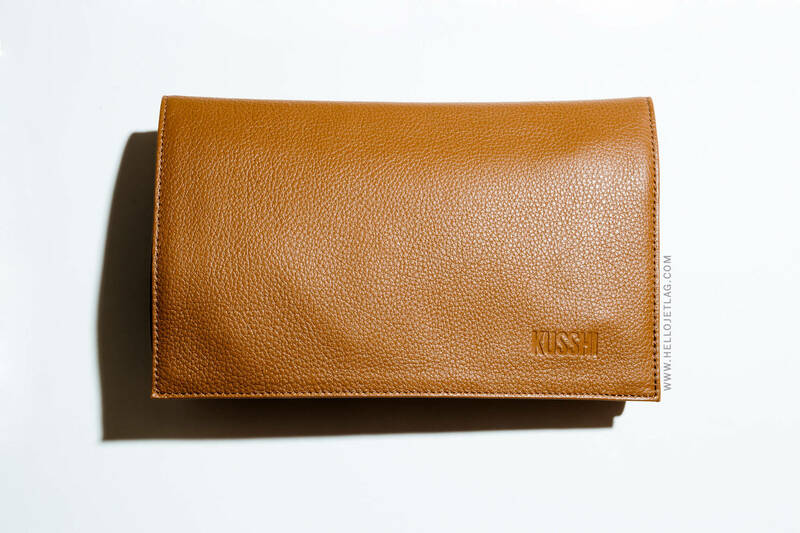 With their chic designs and well executed, travel friendly features, Kusshi is kind of a game changer in the world of travel makeup bags. Let’s judge a book by it’s cover, shall we? 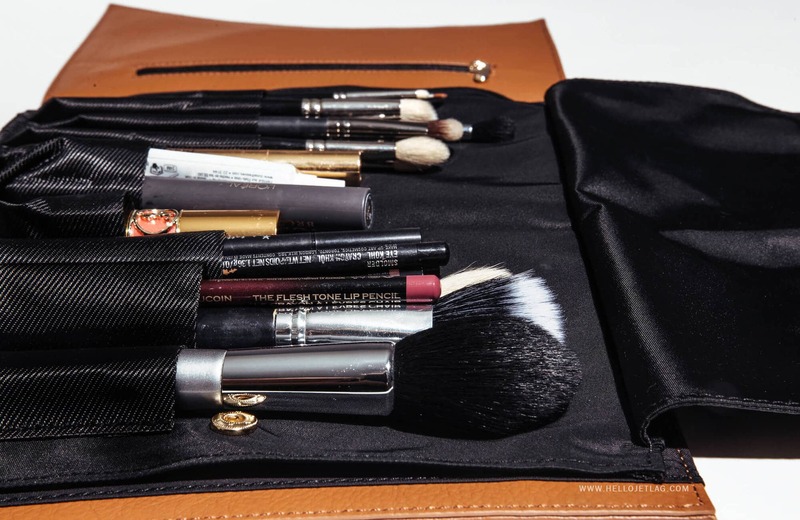 Kusshi designs some of the chicest travel makeup bags on the market. They come in two types of material: micro satin fabric or leather – both with a red nylon interior lining. Depending on which set you get, you can also mix and match the colors to fit your personal style. 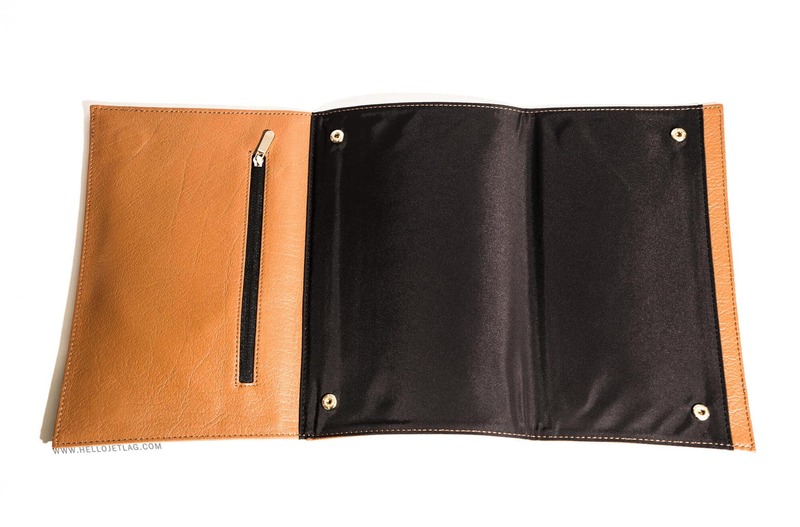 I went with the black leather makeup bag and paired it with a camel colored leather clutch. 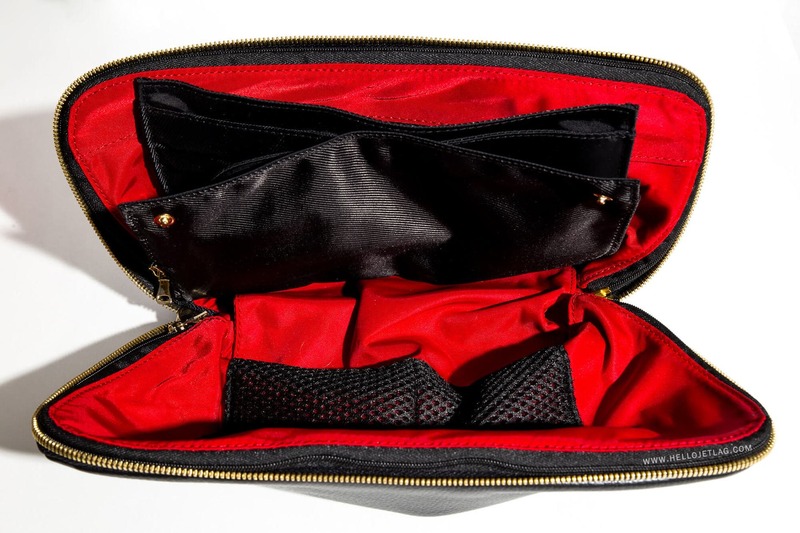 The Kusshi Makeup Bag unzips fully on three sides, so it lays out almost completely flat. This is fantastic for being able to see all of your makeup without having to dig. You can also zip open the top and use it as you would any normal bag. When the two sides are zipped, the bag stands fully on it’s own. 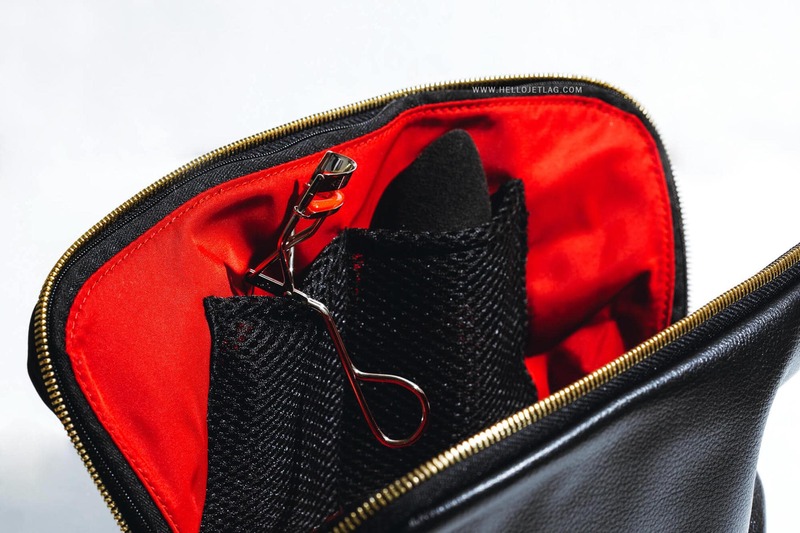 If you’re looking into the interior of the bag, you have the option to unzip the lining on either side, giving you three different compartments for better organization. Or, keep them closed to work out of one main, large pocket. 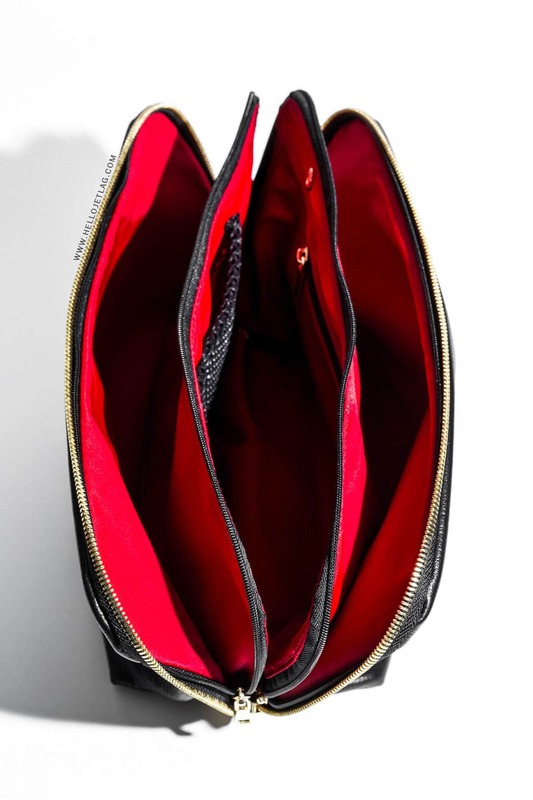 One of my favorite things about the Kusshi Makeup Bag is that they’ve built a separate pouch for your Beauty Blender! A feature that one cannot truly appreciate until you know what it’s like to pull a dirty sponge from the bottom of your makeup clutch after it’s been rolling in broken eyeshadow debris. Not only does your Beauty Blender have a home inside of the Kusshi Makeup Bag, but it’s also made of mesh to let in airflow after washing it, or using it damp. No matter how you slice it, makeup is messy. As organized and sanitary I try to be, I’ve never been able to keep powders from breaking, or foundations from staining the inside of my bags. Kusshi’s fabric Makeup Bags, along with their fabric Clutch Covers and Organizer can be thrown in the wash for easy cleaning. 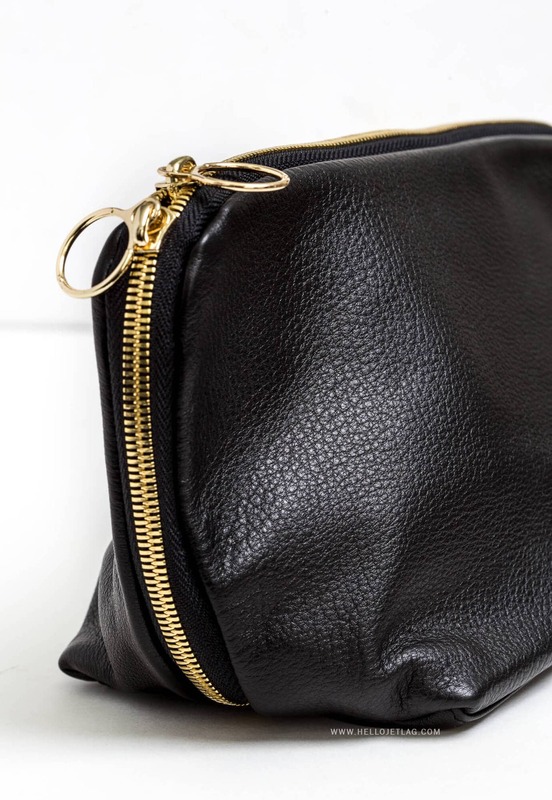 I have the leather makeup bag, which cannot be washed but the lining is made out of nylon, which you can fully unzip, remove from the bag and then wash as normal. 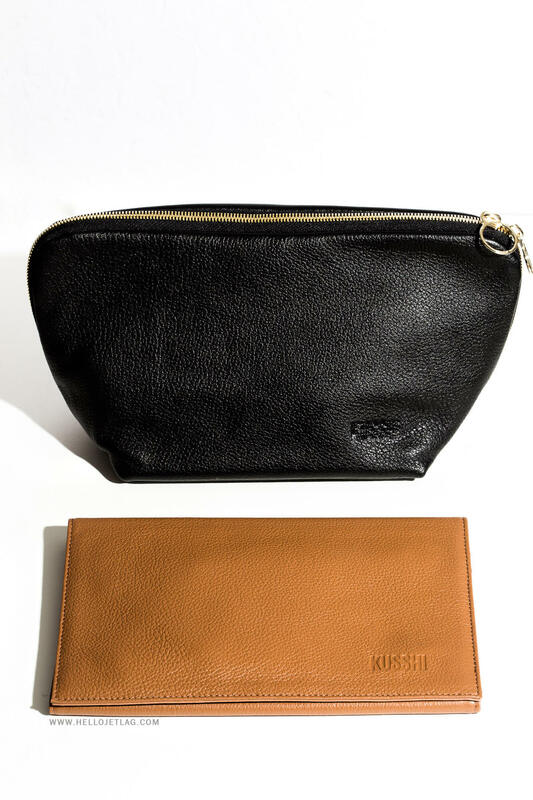 The Kusshi Makeup Bag comes in three different sizes: Everyday, Signature and Vacationer. I have the medium (Signature) which I’ve found to be a really good size for my paired down travel kit. It’s small enough to throw in a purse, but large enough to fit all of my basics. In the picture below, I’ve fit foundation, liquid highlighter, a contour/highlight palette, an eyeshadow quad, an eyeshadow palette, brow gel, bronzer, loose powder, gel eyeliner, a Beauty Blender, rose water spray, eyelash curler and the Kusshi brush roll which has 9 brushes, 3 lip liners, an eyebrow pencil, 2 eyeliners, lipstick, mascara, liquid eyeliner pen and eyelash glue. The Signature bag fits most eyeshadow palettes, but it does start to get a little crowded with more than one palette plus the rest of your makeup. I have also found that it’s a little too small for oversized palettes. I’m looking into the Vacationer for my personal makeup bag for when I’m not traveling, but I’m worried even that might still be too small. For the majority of people, one of Kusshi’s three sizes will be a perfect fit, but I would love it if they went XXL for those of us who have a lot of makeup. In addition to makeup bags, Kusshi also offers a selection of accessories. 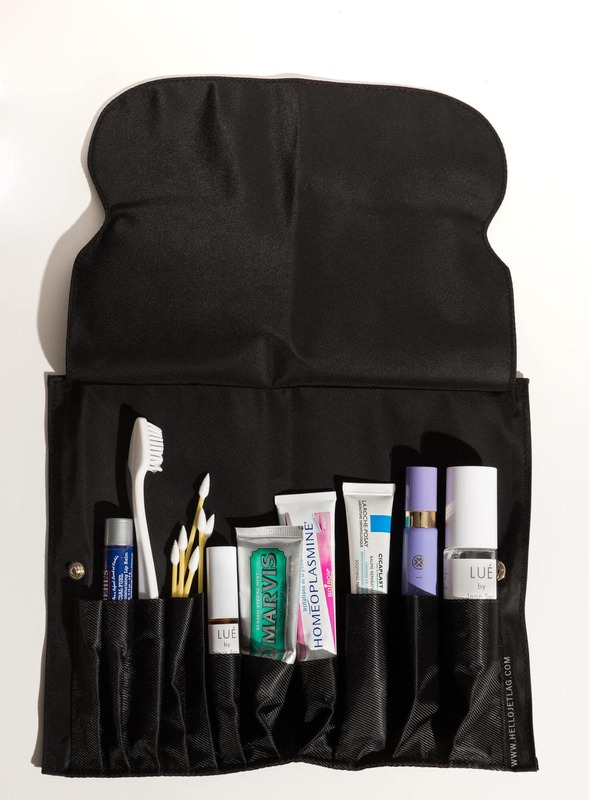 The Organizer is a black nylon insert with 11 pockets for your makeup brushes or other small beauty products. 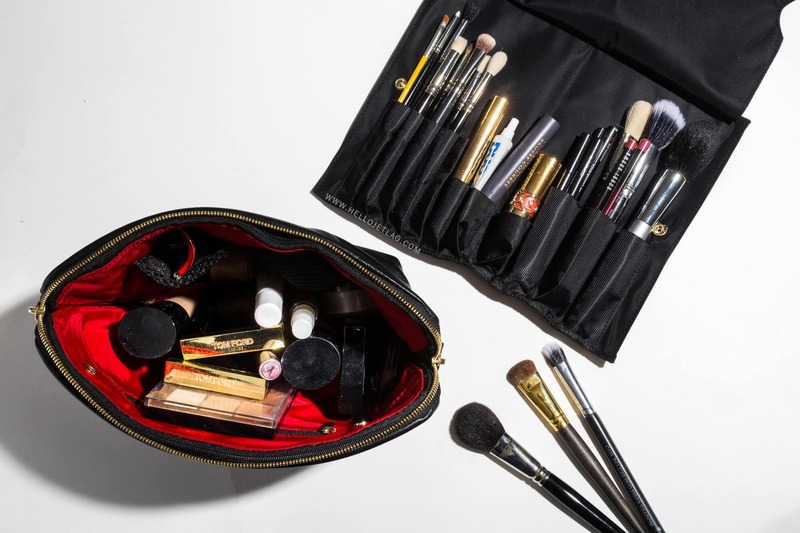 The Organizer snaps into either the makeup bag or the Clutch Cover (more on that below) and it’s a great way to protect your brushes from getting frayed or bent in transit. If you have a lot of brushes, the Organizer will probably be too small, but it does work great for light travel sets. In the Organizer I have been able to fit a foundation brush, bronzer brush, powder brush, 3 eyeshadow brushes, a concealer brush, an eyeliner brush and a smudge brush, plus several eyeliners, lipliners, a concealer, lipstick eyelash glue and mascara. 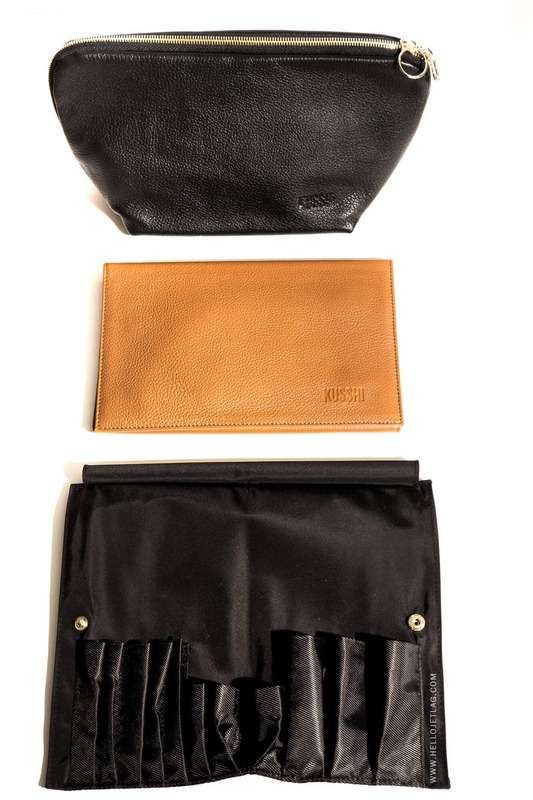 Out of this entire 3 piece set, I have been most excited to test out Kusshi’s Clutch Cover. 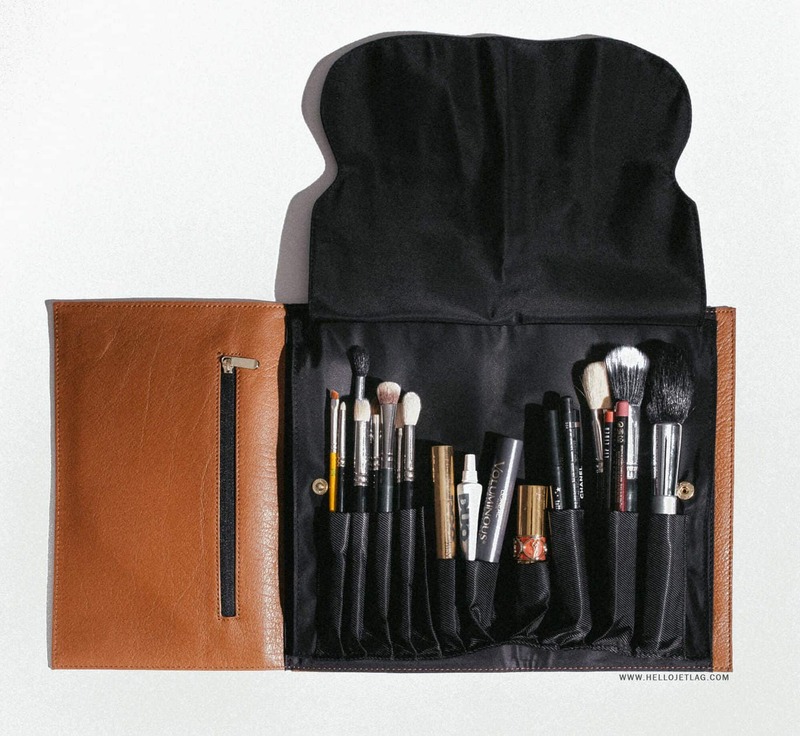 This is how it works: you simply pull the brush Organizer from your Makeup Bag and snap it into the Clutch Cover. 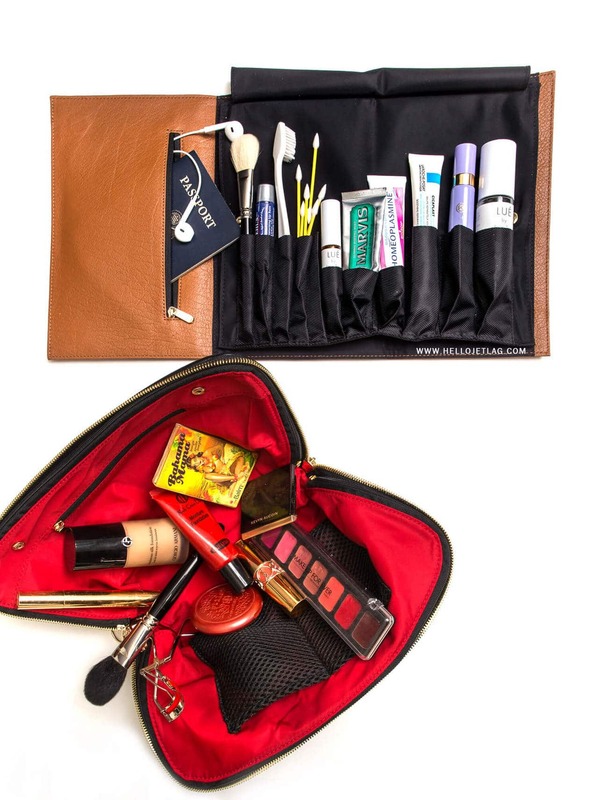 The Clutch folds up, and you have a streamlined carrying case for your brushes, makeup or toiletries. When I travel, I usually have a large carry-on that I store in the overhead bin, plus a tote purse to keep under my seat which has all of the necessary items I need for the flight. 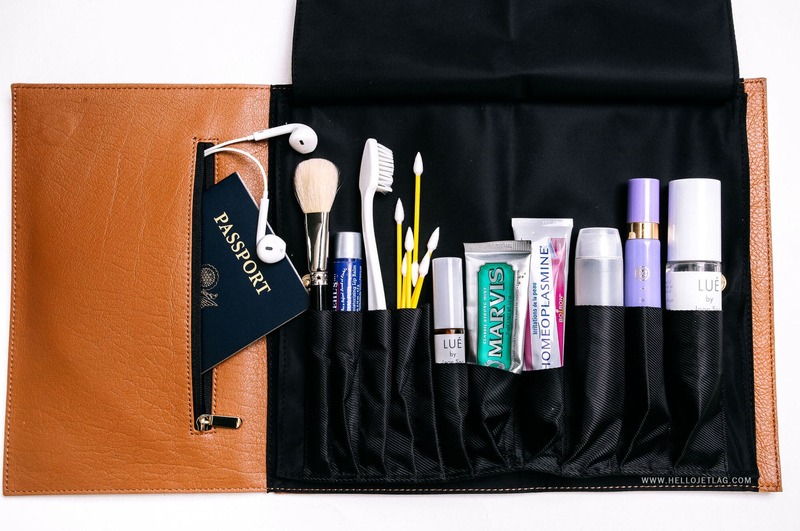 Kusshi’s Clutch is not only a great way to keep all of your immediate toiletries or makeup organized, but it slips down the seat back pocket so you can have all your immediate beauty essentials with you during the flight. 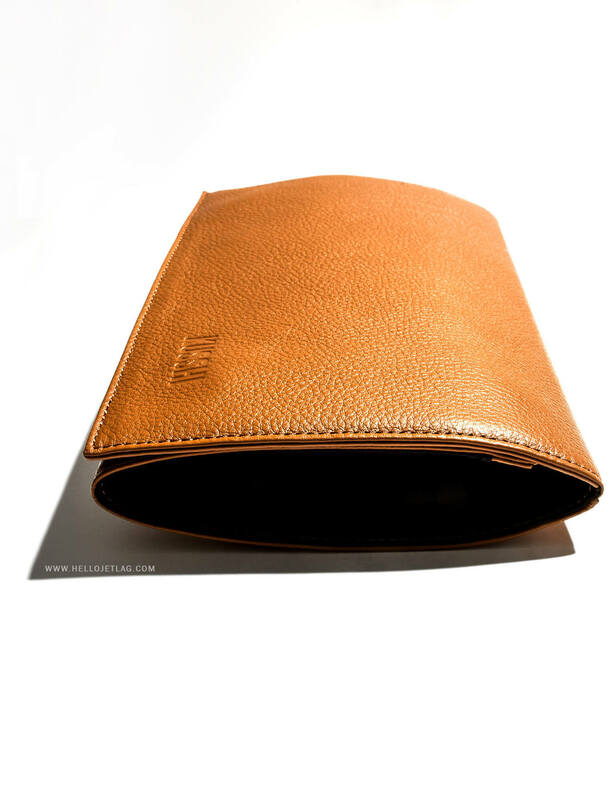 Inside of the Clutch Cover, there is also a small pocket on the side where you can store your Passport, jewelry, earphones, ear plugs etc. I do wish that pocket was a little bigger because I’d love to slip a few beauty items in there that don’t fit into the Organizer pockets. Lately, I’ve been playing around with keeping my in-flight skincare/toiletries inside of the Clutch vs brushes and makeup. I use a lot of Muji Bottles to decant my larger liquids and they fit into the Organizer perfectly. For other products, it’s hit or miss as the pockets are meant for brushes, so they’re pretty narrow. Still, I really like the design and am going to keep experimenting because this is exactly what I’ve been looking for. 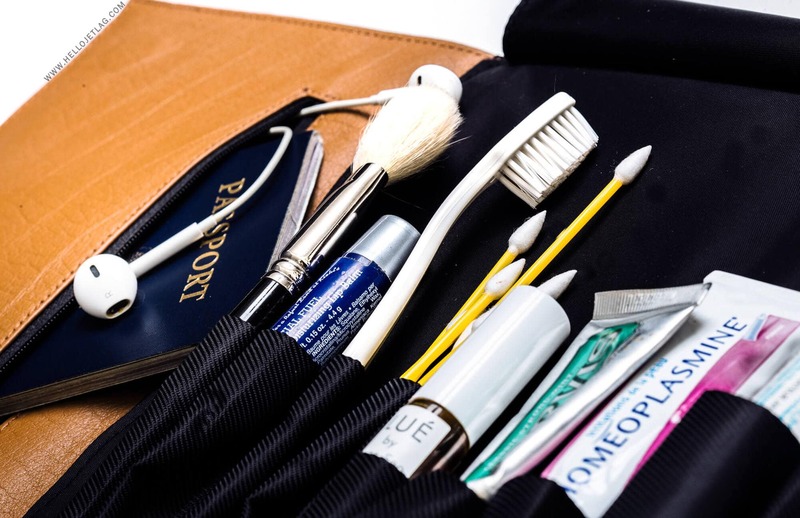 Compared to other travel makeup bags, Kusshi’s products feel extremely well made and expensive. And they are exactly that: extremely well made and fairly expensive. Aside from designer brands, I’ve actually never seen a makeup bag cost as much as these do. It’s definitely a luxury item and investment that I realize not everyone can (or wants to?) make when it comes to travel organization. If you do have the means, these bags are very good quality and they feel like they are going to last a long time. Since my set is new and I haven’t fully been able to test them in every situation, for extended periods of time, I can’t comment on their longevity but I will be updating this post as I go to let you know how they hold up. 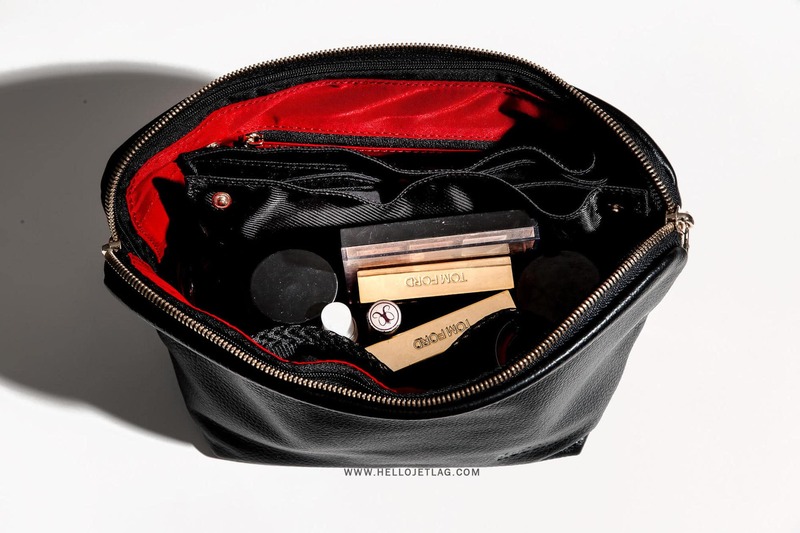 What is your favorite travel makeup bag? Let me know in the comments! DISCLAIMER: Kusshi provided me with a complimentary Signature Set for content consideration. This post is not sponsored and sending me products does not guarantee a review. This post does contain affiliate links which means if you click them and buy something, I receive a small commission which helps me run this site. Thank you for your support! !